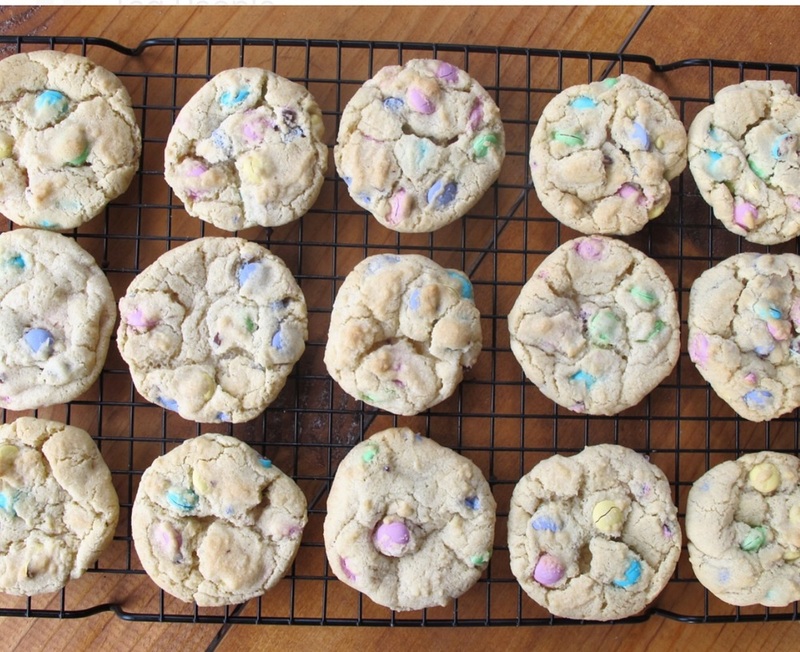 Chewy Spring M&M Cookies — urban. apron. Wedding prep can be tricky. There are so many little things that go into one day; that it causes a bride (or groom) to lose focus. For me, I've struggled with this idea, hating the thought of getting caught up in it, but feeling pulled to do so. As much as I want the best food, music and atmosphere, I also want it to reflect Chad and I. Which for us, means being very simple. No frills. No "foo-foo." Which is also against the wedding chatter, emails, ads and articles I'm innundated with daily. One "little" thing we have done during our wedding prep is take "pre-marital classes" of sorts, required by my hometown church where we'll be married. This prep has turned out to be the most important step in the chaos of wedding planning. Especially with the couple we met with last weekend. We sat in their living room and chatted over good, local coffee (Custom Cup!). We learned about their life, we talked about our life, and we didn't once discuss our wedding colors, flowers or shoes. We talked about love, forgiveness, struggles - the bigger picture that continues loooong after one's wedding day. The most important parts of wedding prep that are often the least talked about! ...I know, this seems deep for a cookie post, but it's the truth! Years from now, I may not remember the color of my flower girls' shoes, programs or whether the food tasted good. But, I'll remember meeting with this couple and how inspired I was, and how Chad and I grew as a couple leading up to the big day. Today, I'm sharing with you these spring-inspired cookies. I brought a bag of these cookies with me last weekend since the couple we met with had 4 little kids. I gave them cookies and they gave us two inspiring books. It's these simple gestures that help shape who we are. In a medium bowl, whisk the flour, baking soda and salt. Set aside. In a mixture, blend the sugars and butter until smooth. Add the egg and egg yolk, mixing. Add in the vanilla. Slowly add in the flour mixture, until combined. Add in the M&M's to mix. Using a cookie scoop, scoop the dough on to a cookie sheet lined with parchment paper. Bake for about 9-10 minutes, rotating sheets halfway through baking. After 10 minutes, take out of turning golden brown or leave in for another minute or two if the middle is still under-baked. Let the cookies cool on the baking sheet and then remove to a wire rack. This recipe will make enough for your whole family to enjoy! My family was all home last weekend and I put the extra cookies in a cookie jar on our counter.